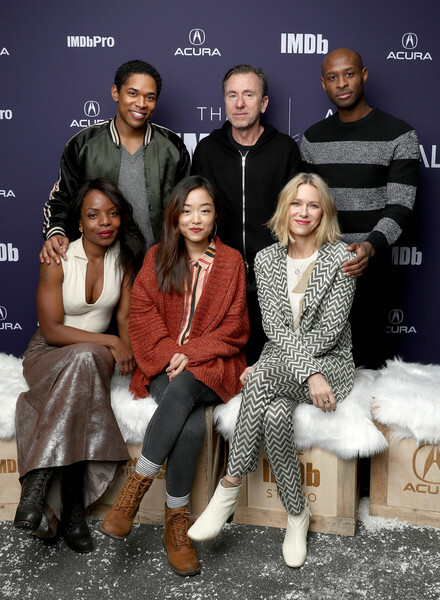 Kelvin Harrison Jr., Tim Roth, Julius Onah, Marsha Stephanie Blake, Andrea Bang, and Naomi Watts of 'Luce' attend The IMDb Studio at Acura Festival Village on location at The 2019 Sundance Film Festival - Day 3 on January 27, 2019 in Park City, Utah. Naomi Watts completed her outfit with white ankle boots. Naomi Watts visited the IMDb Studio at the 2019 Sundance Film Festival wearing a chevron-print pantsuit.